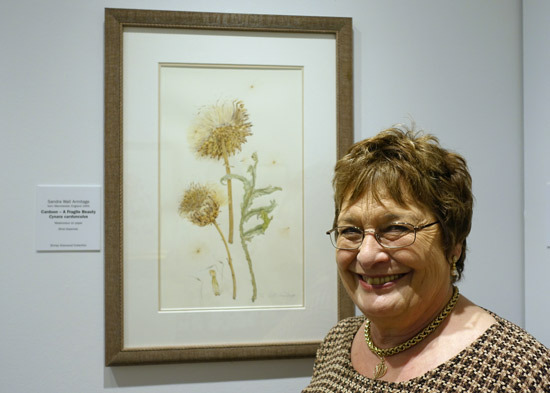 MAKING A MARK: Queuing to visit Shirley Sherwood Gallery of Botanical Art! Queuing to visit Shirley Sherwood Gallery of Botanical Art! 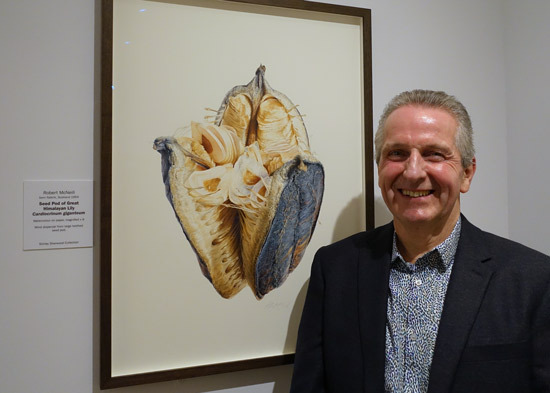 Last night was the Private View for the four new art exhibitions at the Shirley Sherwood Gallery of Botanical Art in the Royal Botanic Gardens at Kew. We were told that some 8,500 people had visited the Gallery last week and that at the weekend people were queuing to get in! The number of visitors and queues will be in no small part related to the Rebecca Louise Law: Life in Death exhibition which is quite unlike anything I've ever seen before. It's an experience! 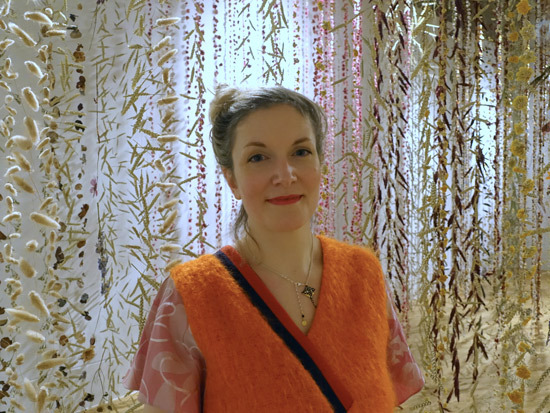 Her exhibition is an installation within the large central space within the Gallery and promotes her passion - the use of preserved plant material as art material. 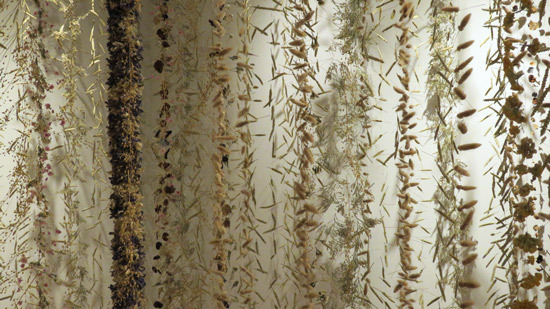 Plants and flowers that she has collected over a ten year period, have been dried and strung on very thin copper wire garlands suspended from grids attached to the ceiling. 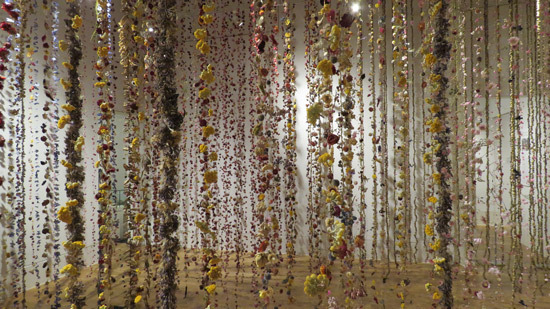 There are 350,000 specimens strung on c.1,000 garlands spaced at intervals of around 12 inches. It seems as if the entire room is completely full of dried flowers and pods. However a wavy path cut through the middle allows visitors to start on one side and move through to an exit via a diagonal which takes you through an amazing range of plant material. What was interesting yesterday was that there was a distinct aroma in the air which I hadn;t noticed previously. Almost like being in the centre of a giant pot-pourri. This exhibition is supported by a separate exhibition (in Gallery 4) of the ancient Egyptian preserved funeral garlands of Ramesses II in Kew's own collection - which date back to 1300BC. This is a very rare public display of the fragile and beautiful ancient Egyptian wreaths, which, draped over mummies and coffins, accompanied the dead to the afterlife. This exhibition forms a portrait of the Brazilian Amazon, resulting from collaboration between the artist Lindsay Sekulowicz and Kew’s Science team. Lindsay Sekulowicz: Plantae Amazonicae combines new artworks by Lindsay with items from the economic botany collection maintained by Kew. Kew holds 260 rare and fascinating artefacts and raw plant materials collected by Richard Spruce in South America. The items and artworks in the exhibition explore material, function and meaning, cultural knowledge and scientific study. the artist Lindsay Sekulowicz who took on the role of Artist in residence at the Economic Botany Collection in Kew Gardens working on a project based on the collections of botanist and explorer Richard Spruce to create new artworks in various forms. Plantae Amazonicae exhibition leaflets printed! Beautiful design by @carolmontpartstudio and pictures by @elenaheatherwick thank you both so much! 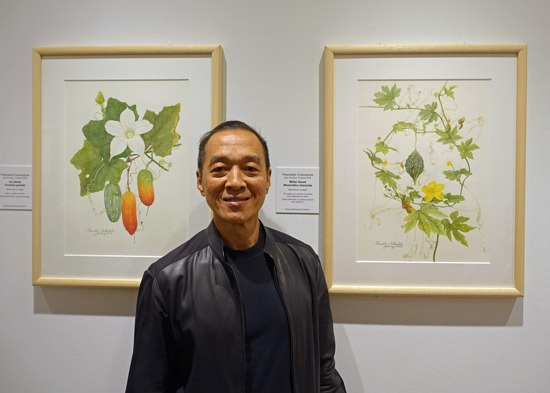 The latest - and excellent - exhibition of botanical art from botanical artists around the world is titled Abundance: seeds, pods and autumn fruits. 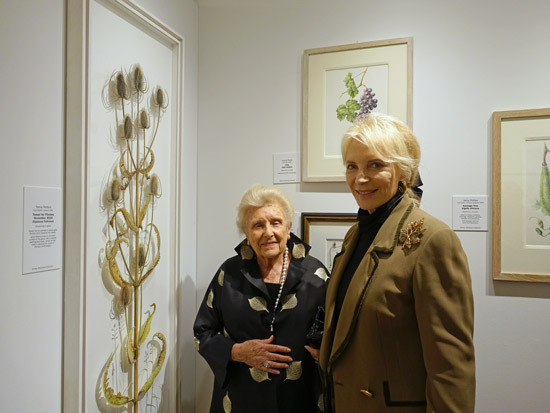 I'll be publishing my review of this exhibition - which will also list all the works in the show - on my Botanical Art and Artists - News blog on Sunday. 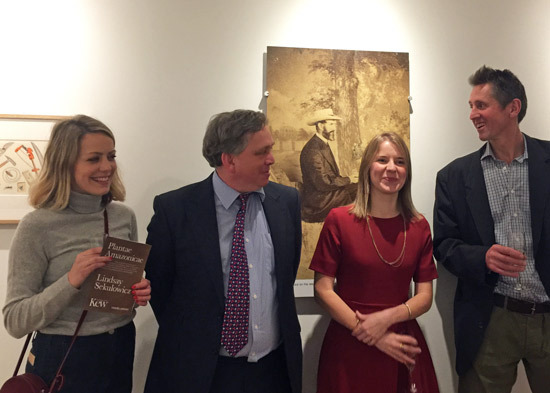 In the meantime, here are a few photos from last night's Private View. The gallery is open daily from 10am. The time it closes varies by date. Oh Katherine thank you for this post. I've always wanted to see a Law piece in real life. And to see one at the Sherwood Gallery must be amazing. I'd never heard of the other young woman - her work is fascinating. Love people so devoted to flowers and combining old and new. Thanks again.